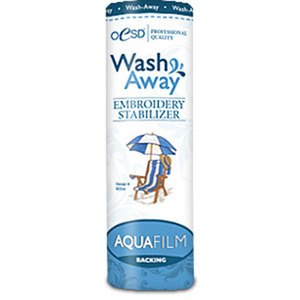 Water Soluble Stabilizer for Embroidery Machine Hoops, for Lace, For use as a stabilizer when sewing on sheer, lightweight, and fine fabrics when all traces of the stabilizer must be removed from the fabric - perfect for stand-alone lace. Use as an alternative topping when stitching on fabric with texture, such as terry cloth. Dissolves completely with lukewarm water. 8" wide x 10 yds long.